Saying “Alternative wedding photography” doesn’t feel the right way to start this wedding blog, if I’m honest. However, covering a Druid Handfasting ceremony is something we’d never done before. We loved it! Phil and Mary are one of the greatest couples we’ve had the pleasure to know. They’re gifted with great personalities, and a calming and refreshing outlook on life. They also live in a truly wonderful place, in a very quiet corner of Meanwood. Perfect combination if you ask me! I usually start off by moaning about the weather. No need this time as it was all fine, for most of the day anyway! Both Phil and Mary were getting ready at home, so the prep shots were a joy for once. No dashing around in the car today! With only the late Charlie to distract us (their beautiful old ginger cat), the prep shots were done without stress. We were soon on separate vintage buses heading for Leeds. The formal ceremony was being held at Leeds Town Hall. I’ve worked here a few times, but the room where they were getting married in was a new one for me. 30ft high ceilings, and as much natural light as imaginable. Happy days! 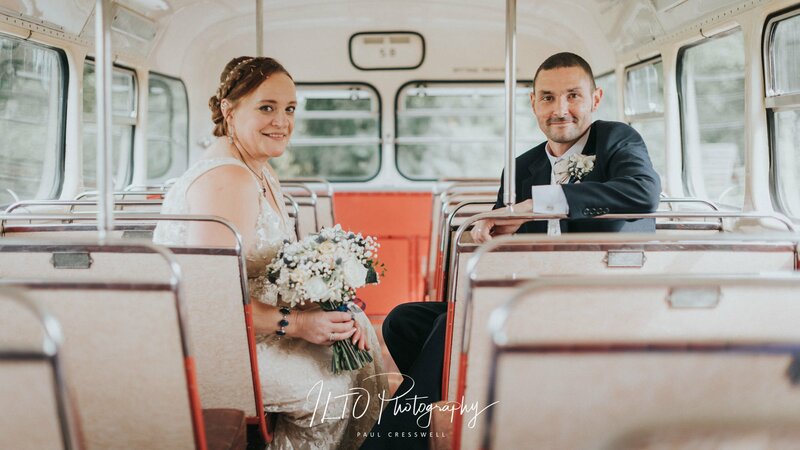 The “I Do’s” were quickly over, and after a few formals on the steps of the venue, we were back on our buses and heading for Meanwood. Phil & Mary live in a converted coach house from the 1630’s. According to the records, it was also the first pub in Leeds! They have acres of forests, garden and space to play with. I was in my element! Craft beers and bubbles were necked by al the guests, and before long we were at the Handfasting Ceremony. The couples hands are tied together. They are surrounded by 4 wedding guests represented North, East, South & West, the 4 elements too. After reading a specific passage for each element, they then take it turns to add a coloured ribbon to there tied hands. When they have all done this, a final purple ribbon is tied also. Wine and food are shared to mark the end of the ceremony. The rest of the wedding guests, who have been watching from a large circle surrounding them all, all burst into applause, smiles and laughter! Off for a mooch around the “garden”… which was actually a proper walk through the woods that surround the back of the house. Smiles, laughs and camera flashes. Speeches, cake cutting and first dance. Job done, we pack up our gear head off home with full hearts and a spring in our step! It was truly a privilege to be part of something so different and personal. The perfect ceremony for the perfect couple.